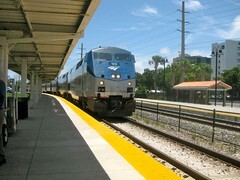 I took Amtrak from West Palm Beach to Tampa for a 1-day/2-night visit with lifelong friends from ‘up north’. I armed myself with a good novel, my ipod and snacks and found the experience totally bearable, if not completely enjoyable. The Silver Bullet got me there in 3.5 hours. 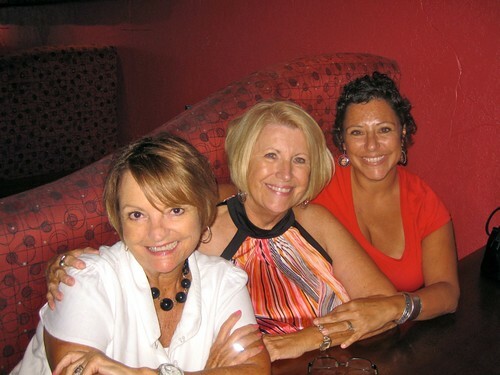 Girls’ reunion dinner in South Tampa restaurant. 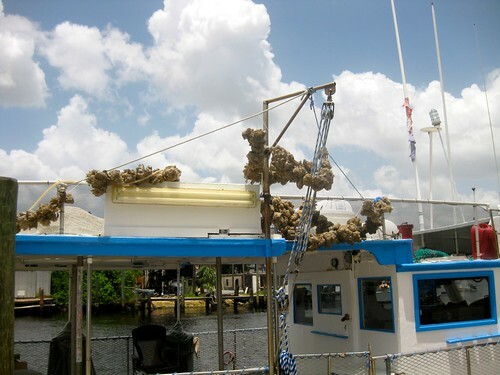 A FOODalogue view of Tarpon Springs. 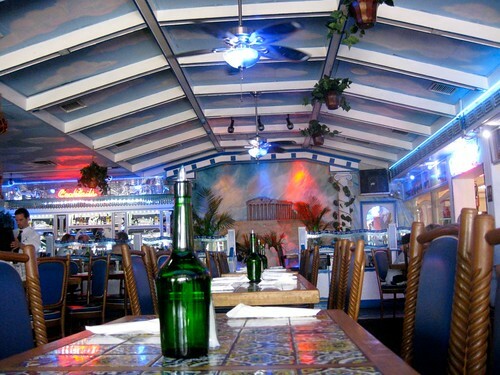 Lunch at Hellas Restaurant + Bakery which radiates the colors of Greece in a very kitsch manner. If you’ve been to Greece, you no doubt have had Frappé, an iced Nescafe drink that is served in all the cafes. I was excited to see it offered in the bakery side of the restaurant. So, of course, we had to try one and a piece of pastry (saragli). 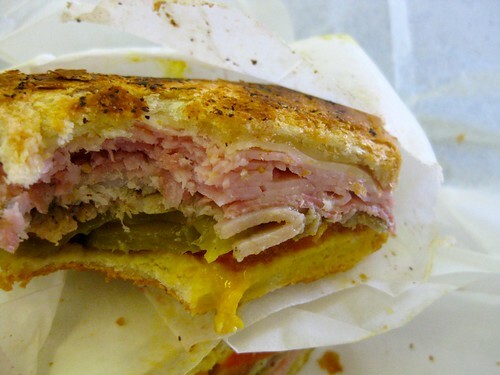 And one cannot stop in Ybor City (the site of the Amtrak station in Tampa) without stopping for a Cuban Sandwich. Though I didn’t check, I’m sure this had to be a lot better than whatever was being sold in the dining car. How cool! I can’t believe you had a frappé outside of Greece that looked authentic! 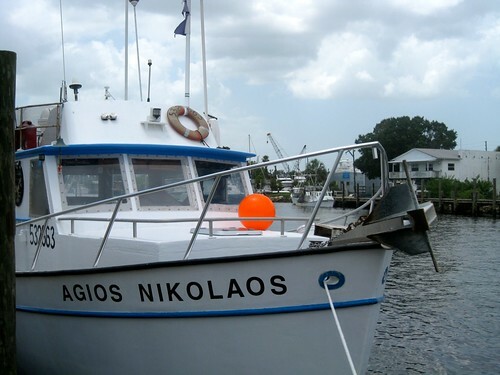 Tarpon Springs really does have a Greek feel to it. 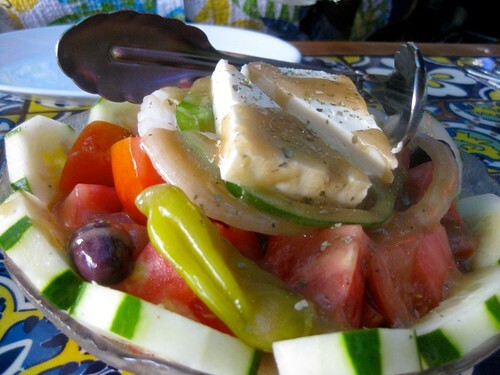 It really does look like a slice of Greece Joan!!!!! 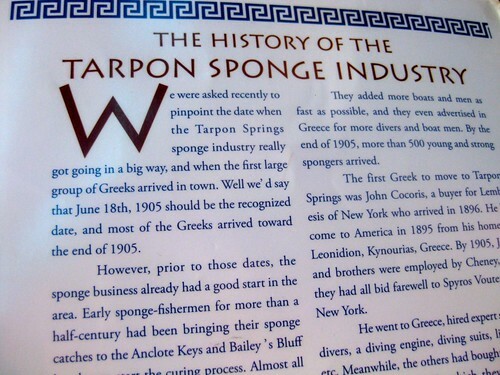 I’ve heard so much from friends who have been to Tarpon Springs and how Greek it is, thanks for the post card – OPA! It looks like a really cool place to visit. 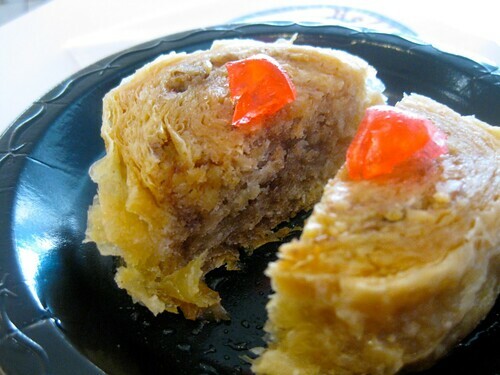 Is the photo in the middle baklava??? This is a must trip for me next time around. Funny, I will be doing a greek dinnner on Tuesday for my clients. Thanks for sharing. First off, love that tiger print tank top, very pretty! Also I am interested in what novel you read on the train, I am always looking for a good read. That places looks like Little Greece, so glad you had a great time with friends. Also have you heard back from the folks that called you about a TV show- I would love to see you on screen, I think you would be so much fun!! As you can see Joan makes an adventure out of every trip! 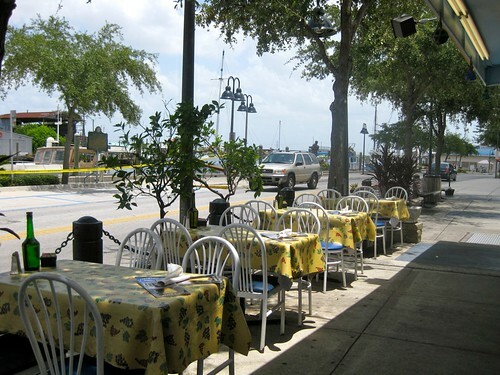 Tarpon Springs has benefited from her visit and lovely picture essay. Looks like you had fun! 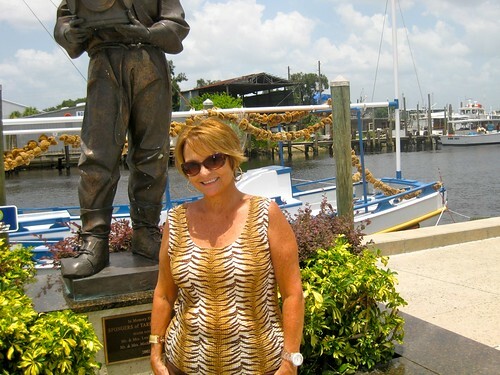 I was just there for a quick visit with family and a doc’s visit in St. Pete and we went to one of the spots in Tarpon Springs for dinner that evening. 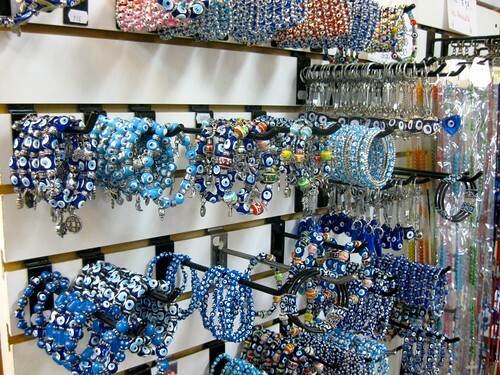 It is a really neat area and the Greek food is always great! 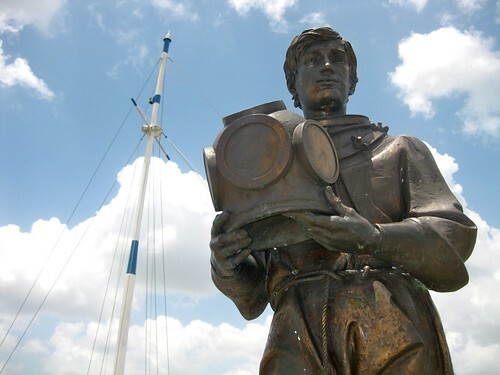 I’ve never heard of Tarpon Springs. How nice that just a train ride away you can get there and visit friends and have great food. 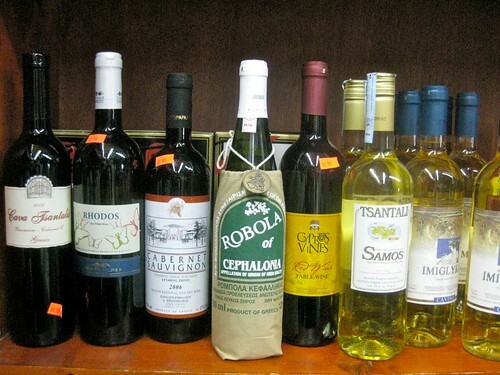 It’s steeped in the Greek culture very much like the various ‘Chinatowns’ and ‘Little Italys’ you find in many cities. 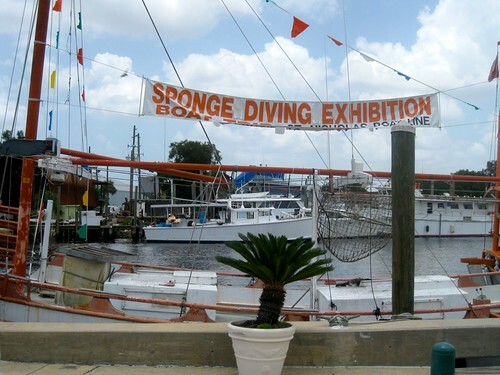 I’ve visited Tarpon Springs several times. Love it! 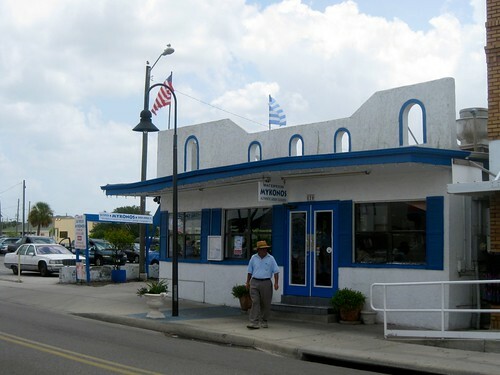 What an incredible slice of Greece right here in the US of A! friends and food is such a good combo. I need a babysitter. 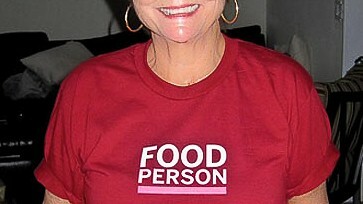 Oh Joan you have captured the very essence of Tarpon Springs! 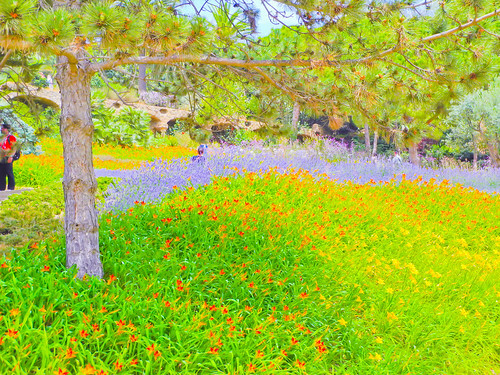 Then again, I would expect nothing less from you :)Amazing place. 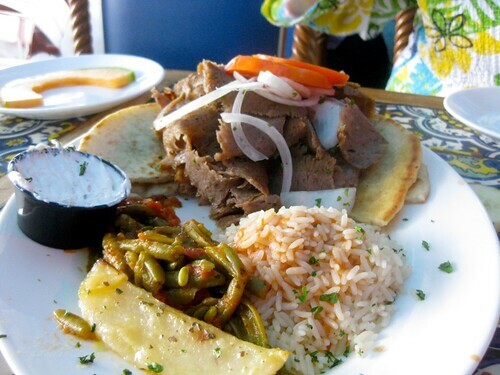 And Ybor… glad it was daytime when you stopped for that yummy Cuban ’cause it’s a whole different place after dark. This really brings back memories. I used to go to Clearwater Beach with my grandparents at least once a year, sometimes twice. 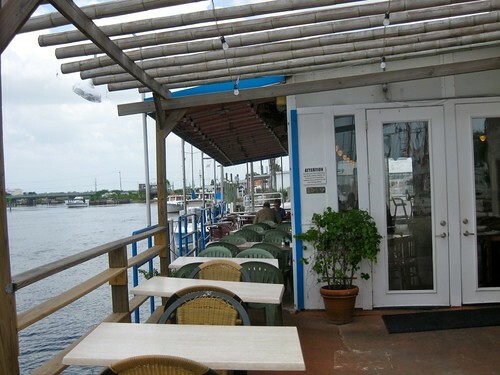 We always went to Tarpon Springs of course (and ate at Pappas – not sure if it’s still there?). 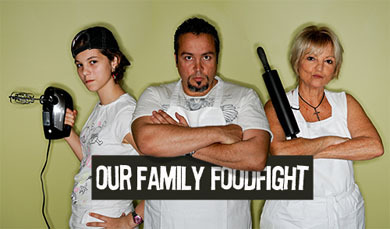 My grandma’s cousin has a restaurant there, too (Plaka). I haven’t been in ages, though! What a fun mini-trip. Here in Southern California we have Catalina Island, a trip over there makes you feel like you’ve traveled all the way to Europe and it is only 26 miles away. Photo of you and the girls is great! I bet that sandwich cubano was awesome! 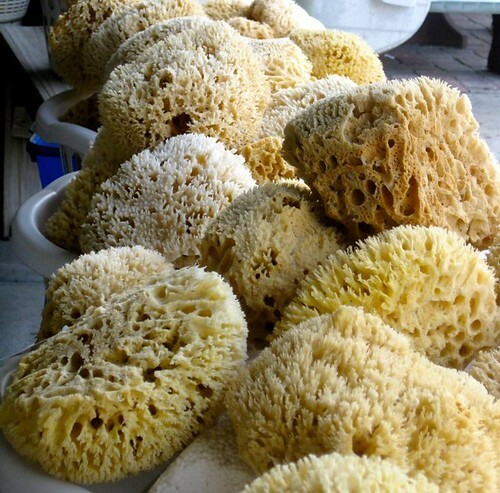 Never heard of it until now – and who wouldn’t want to go? Great shots and what a beautiful vacation spot. Lucky souls who live there.